KALAHANDI POST: SB Order No. 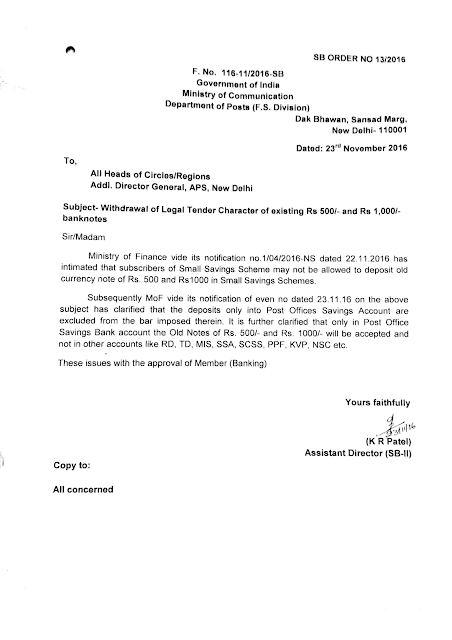 13/2016 dated 23.11.2016 regarding acceptance of WOS currency notes in Post Office Saving Bank Account only and not in other accounts like RD, TD, MIS, SSA, SCSS, PPF, KVP, NSC etc. SB Order No. 13/2016 dated 23.11.2016 regarding acceptance of WOS currency notes in Post Office Saving Bank Account only and not in other accounts like RD, TD, MIS, SSA, SCSS, PPF, KVP, NSC etc. I am a regular reader of your blog. the blog is very interesting and will be much useful for us. I really enjoyed very much with this article here. Really its a amazing article I had ever read. I hope it will help a lot for all.